Research on the factors determining the use of dialect in the Netherland against the background of sociocultural developments. Dutch Identitycrisis. Plot and interpretation of factor loadings of table 3 (p. 46) (see here as pdf). 1) Dialect attitudes are acquired in childhood within the family by contact with parents and siblings. 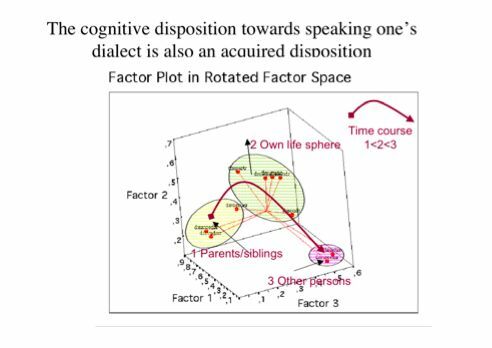 2) Dialect attitudes are modified in one’s own, later life sphere, like marriage/partnership in contacts with one’s children, friends, colleagues, and neighbours. 3) Dialect attitudes change in contact with other persons, strangers and officials like one’s general practitioner. (Solidarity and distance could be secondary to this development). A.C.M. Goeman (2006) Die Determinanten von Dialektsprechen in den Niederlanden unmittelbar vor der Holländischen Identitätskrise. Graduiertenkolloquium, Forschungsinstitut für deutsche Sprache, Deutscher Sprachatlas; Philipps-Universität, Marburg, Duitsland, 15-02-2006. Goeman, T. (2008) Morphological umlaut in verbs in present day Low Saxon and Low Frankish dialects. Workshop on Umlaut in Germanic dialects. Meertens Workshop on Umlaut, Amsterdam, 12-6-2008.